The Farm Gate Market presents their Spring Plant Sale! 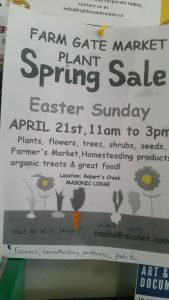 Celebrate Easter Sunday & browse over plants, flowers, shrubs, seeds, trees, organic treats & other garden items. There will also be a farmer’s market, homesteading products, great food & more! It’s from 11am-3pm, it’s free to attend & everyone’s welcome.